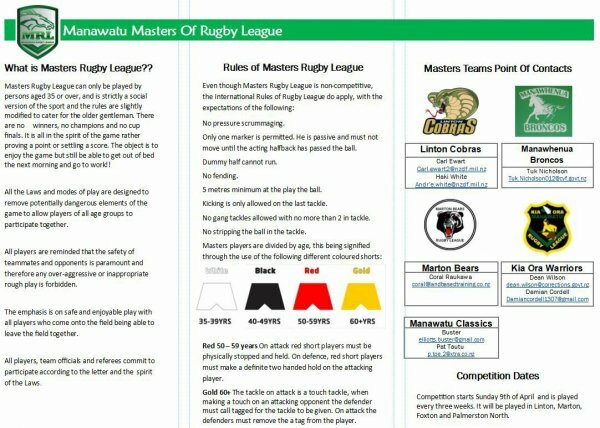 Manawatu Masters of Rugby League was established at the end of 2016 in order to provide players over 35 years of age the ability to play non-competitive Rugby League. Four teams were established to play, that being Kia Ora Warriors, Linton Cobras, Marton Bears, and Manawhenua Broncos. Games were scheduled to be played every three weeks on a Sunday at a central location. For more information, please email: manawatumasters@vodafone.co.nz or search for Manawatu Masters of Rugby League on Facebook.